This is a statement of the practices Allied Recycling Limited (“Allied”) in connection with the capture of personal data on this website or through other communication means and the steps taken by Allied to respect your privacy. Allied is not responsible for the content or data protection practices of other websites which may be accessed through the Allied website. It is Allied’s policy to identify clearly links to external websites and it is your responsibility to satisfy yourself as to the adequacy of the practices of said linked sites. Allied Recycling needs to collect and use data (information) for a variety of purposes about its colleagues, customers and suppliers who come in contact with our organisation. The purposes of processing data include the organisation and administration of general business, research activities, the recruitment and payment of colleagues and compliance with statutory obligations. Data Protection is the safeguarding of the privacy rights of individuals in relation to the processing of personal data. The Data Protection Act 1988 and the Data Protection (Amendment) Act 2003 confer rights on individuals as well as responsibilities on those persons processing personal data. Personal data, both automated and manual are data relating to a living individual who is or can be identified, either from the data or from the data in conjunction with other information. Do I get email from you? What if I do not want to receive it? Yes. All “Opt-in” customers will receive e-mail and text updates about important changes to the website, new services and service updates, and special offers. If you do not wish to receive them, please visit the “Account Details” page to change your preferences at any time. You have the right to request a copy of the information relating to you that is held by Allied Recycling by utilising a Data Access Request. This request costs €6.35 and has to be made in writing by letter or email. Once you have made your request, and paid any appropriate fee, you will be given the information within 21 working days. 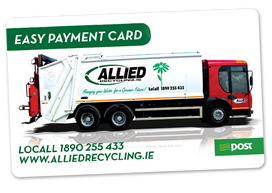 You also have the right to ask Allied Recycling to correct any inaccuracies in any information held by us about you. Why does Allied Recycling collect personal information? Your personal information (Name, Postal Address, eMail and Phone Number) allows us to contact you, if necessary, to process your account top ups and to notify you of any service changes and/or disruptions. It provides you with the opportunity to access parts of the website where legal requirements apply. This policy is a statement of Allied Recycling’s commitment to protect the rights and privacy of individuals in accordance with the Data Protection Act 1988 and the Data Protection (Amendment) Act 2003. Allied will obtain and process personal data fairly and in accordance with the fulfilment of its functions. Allied will keep data for purposes that are specific, lawful and clearly stated and the data will only be processed in a manner compatible with these purposes. Allied will only disclose personal data that is necessary for the purpose/s or compatible with the purpose/s for which it collects and keeps the data. Allied will take appropriate security measures against unauthorised access to, or alteration, disclosure or destruction of, the data and against their accidental loss or destruction. Greyhound is aware that high standards of security are essential for all personal information. Allied will have procedures that are adequate to ensure high levels of data accuracy. Allied will examine the general requirement to keep personal data up-to-date. Allied will put in place appropriate procedures to assist staff in keeping data up-to-date. Personal data held by Allied will be adequate, relevant and not excessive in relation to the purpose/s for which it is kept. Allied will have a policy on retention periods for personal data. Allied will have procedures in place to ensure that data subjects can exercise their rights under the Data Protection legislation. Will Allied disclose the information it collects to third parties? - Protect the rights, property or safety of Greyhound, our users, and others. - In order to make improvements to our website, we may gather non-personal information that helps us understand how customers use it. For example, we may research the collected information to determine which areas of the website our customers most frequently access. - Allied may provide aggregate statistics about our customers, sales, traffic patterns, and related site information to reputable third-party vendors, but these statistics will not include individual identifying information. Personal information, like your name and email address, will not be used in our research. Allied has overall responsibility for ensuring compliance with the Data Protection legislation. However, all colleagues of Allied Recycling who collect and/or control the contents and use of personal data are also responsible for compliance with the Data Protection legislation. Allied Recycling will provide support, assistance, advice and training to all departments, offices and colleagues to ensure it is in a position to comply with the legislation. Allied Recycling has appointed a Data Protection Officer who will assist the business and its staff in complying with the Data Protection legislation. This policy supports the provision of a structure to assist in Allied Recycling’s compliance with the Data Protection legislation, including the provision of best practice guidelines and procedures in relation to all aspects of Data Protection. This statement should not be construed as a contractual undertaking. Allied reserves the right to review and amend this statement at any time within 30 days of any changes taking place and you should therefore re-visit this webpage from time to time.